Experts estimate 92% of us are at risk because the typical western diet, high in animal products and sweet, sugary processed foods, makes our blood extremely acidic. Research confirms diseases thrive in acidic conditions. All minerals are alkaline by nature and work in unison to keep our blood’s pH in perfect balance (pH 7.45). 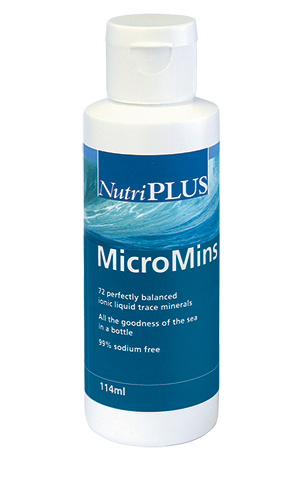 MicroMins® contains the full spectrum of over 72 minerals and trace elements in liquid form, making it highly bio-available. Ideal for restoring every cell in your body to a healthy natural, pH balanced state. And yet... they all live much longer than we do, they age more slowly and they are practically devoid of the diseases of old age that plague western countries. The answer turns out to be simple. The water they drink and use to water their crops comes from melted glaciers and is extremely rich in minerals and trace elements. And I’ve seen this long-life miracle for myself. Back in 1979 I went to the Republic of Abkhazia (next to the Republic of Georgia) with a number of other American scientists to study centenarians. I met a woman who had just celebrated her 105th birthday. Her son lived next door to her. He was 87 years of age. In studying the diets of this family and others like them, we soon found that their diets were extremely rich in minerals. In the early 1970s an American doctor called Alexander Leaf MD, visited the remote Andean village of Vilcabamba in Ecuador. There he met Hermelinda Leon (then 95) and Miguel Carpio (then 123). They and others like them were very active and still worked their crops all day. Through careful evaluation of their diets, Dr. Leaf found their foods were all packed with minerals. The doctors attributed 50% of their incredible health and longevity to genetic influences and 50% to their diet, which is very low in animal and trans-fats and exceptionally high in minerals. They came to the inevitable conclusion that if people in the West want to be just as healthy and long lived as the Okinawans, we must consume more minerals. But how? MicroMins® is the end result of years of research. It’s made naturally by evaporating the already concentrated waters of Utah’s Great Salt Lake into a super concentrated formula. 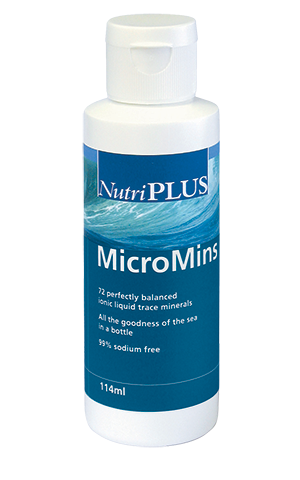 Because MicroMins® comes from an entirely natural source it contains the full spectrum of minerals and trace minerals in perfect balance to one another. Even more importantly they are so microscopically small they are suspended in liquid form, making them incredibly easy for the human body to absorb and use. Most artificially made supplements use cheap, commercially mined minerals whose molecules are far too big for your body to absorb. They pass straight through you without doing any good! Take MicroMins® and you’ll really notice it making a difference. It will bring your body back into balance; cleansing, recharging and clearing waste materials from damaged cells and restoring them to their natural healthy vibrant states. Just a few drops, two or three times a day in water, juice or tea is all you need to re-create the perfect balance of trace minerals in your blood stream, which your body has evolved to perform its best on. If you’re suffering from a mineral imbalance or deficiency (and it's highly likely to be the case) MicroMins® could make an immediate improvement to your health and when taken consistently has proven highly beneficial for every age related disease you can think of. And with our 6 month 100% money back guarantee you can try MicroMins® without any financial risk and see for yourself just how well it works. Thousands of other people already take MicroMins® because they know it works. Since you risk nothing, why not find out how well it could work for you, by reserving your supply today? Allow at least one drop of MicroMins® per 6lbs (2.7kg) of body weight. For example: a person weighing 160lbs requires a minimum of 26 drops per day. More may be taken if desired. MicroMins® is best consumed in several smaller doses of 5 to 7 drops at a time spread out through the day. When 5 drops are mixed into a 7oz glass of water it gives the water a smooth, milky taste. In fact many people think ordinary water tastes "empty" without it. MicroMins® can also be mixed with juices, teas, coffee, sprinkled on food or used as a salt substitute in cooking.